Snapper 2, System Tool from Audio Ease. 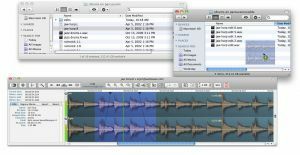 Audio Ease has released version 2.0 of Snapper, the on-screen waveform that appears as soon as you select a sound file in the Mac Finder. With Snapper, while staying in the Finder, you can grab a part of the waveform and drag it anywhere: into another Finder window to create a new file, into tracks of your editing software, or you can convert it to split-stereo, mp3, mp4, etc. You can extract audio from video, normalize, fade, or shoot the selection up to the cursor of your Pro Tools, Nuendo, Cubase or Logic. All without ever leaving the Mac Finder. Much improved integration with Snow Leopard. Spot-to-cursor supports Nuendo, Cubase, Logic and ProTools. 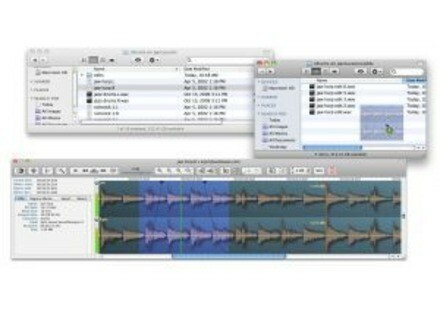 Drag selections anywhere, into tracks of any DAW, video editor or even iChat or mail. Better looking waveforms that build up quicker, and zoom smoother. New edit features such as a trim tool, fades and normalizing. Varispeed playback without pitch shift. And dozens of other features. Audio Ease has made a 100 second overview tour of Snapper 2, and a movie about only the new features at audioease.com/snapper. You can try for yourself using Snapper's 100 day fully functional demo. Snapper 2 costs €59 or $79; upgrades cost €39 or $49. Anyone that purchased Snapper in the past 6 months gets a free upgrade. SWA Complete Cubase 5.5 Tutorial SWA Complete Cubase 5.5 by Streamworks Audio contains two hours of tutorial videos explaining the new features and capabilities of Steinberg's DAW Cubase.